I have lots of stuff in my house. I tend to save fabric, bentwood chairs that need refinishing, the kids' school work, stones from past vacations, mason jars for cranberry chutney in the fall and wildflowers in the summer, and cats. Occasionally I do clean out and pair down what has accumulated, except for the cats. But the hardest things to part with are books. When shelves overflow I know it is time to weed. Fiction fast-reads are donated to the library book sale. I don't feel bad about those - There are more than enough Patricia Cornwell and Robert Parker titles out in the world. There are tons of John McPhee and E.O. Wilson out there too, but I hesitate more on those decisions. I use adult nonfiction for research. I like to be able to grab a book off my shelf, rather than log onto the Internet, to double check a date, verify a name, find out when a tree is in flower, or the eating habits of an insect. I have a separate shelf with a full range of identification guides that I'll never part with. They are a staple for any science and nature writer. Some nonfiction books I may not be able to toss, but I might be able to put in a box in the attic -- although for me out of sight out of mind is a daily dilemma. So, what books are box-worthy? I started with my college anthropology books - Margaret Mead, Colin Renfrew, etc. Not thrilled to no longer have them at my fingertips, but if the dust on the tops of them are any indication, I haven't fingered them in a while. Those seem safe to put away. But the research books I used to write my own books, have to stay on the shelf. At least the most important ones -- my forensic stuff like Ubelaker, Joyce and Stover, Manheim -- I spent a lot of time with these titles and they remind me of the interviews I conducted with some of the scientists who wrote them. Plus, on rare occasions I am asked to speak on forensics, and I have to review a few facts beforehand. 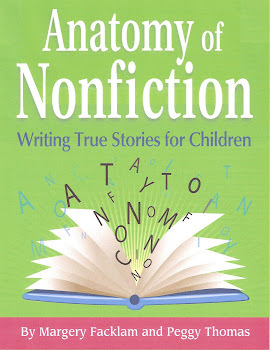 My biggest problem is parting with older nonfiction- especially if they are children's books and well illustrated. Libraries might weed their nonfiction every 5- 7 years to keep the information current, but I can't. In fact, I am the collector of those discards. These books are as sad as a kitten clinging to my window screen (that is another story). They have helped hundreds of kids with science projects and book reports. They are tired, faded and repaired, but still beautiful to me, even if their information is dated, and one day my books will be subject to the same fate.So, it's Peggy to the rescue. I love space books written in the 50s when astronauts were a new species and the now defunct space shuttle was not even a glimmer in NASA's eye. I love the art in the margins of Holling Clancy Holling books. In Minn of the Mississippi (1951) the snapping turtle starts out in his egg, shown with a ruler, 1 inch long, and diagrams show the albumen, yolk and stages of growth. Boys who wouldn't read the big blocks of text could follow the maps in the margins and read about the tools of the Indians. M. Sasek's This Is series showcased New York City, Ireland, England, and Cape Kennedy in quirky 1960 Pink Panther-esque style. The Story of Florida (1947) has original lithographs by C. H. Dewitt with colors that glow on the linen pages. 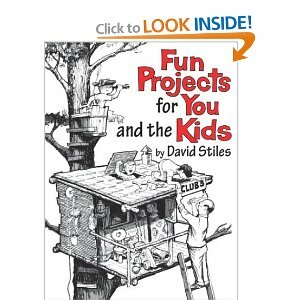 And I dreamed of building one of David R. Stiles Fun Projects for Dad and the Kids (1963) -- maybe the Water House or the Spook House with a hidden trap door and cellar. You could make a balloon raft made from a parachute from the Army surplus store, a row boat, sail boat, cross bow and even a cannon! Although I never built these things, it was nice to know there was an adult out there somewhere who thought it would be okay if I did. I often wondered what Stiles's backyard looked like. The funny thing is, some of these titles are still in print. 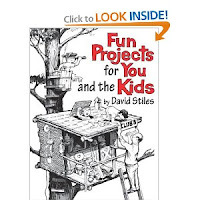 When I searched for pictures to include in this blog, I found that M. Sasek books have been re-released, and Minn and the Fun Projects are available in paperback. So do I really need to rescue my tattered library bound discards? Yes. As an old nonfiction writer, I have a solft spot in my heart for these old editions. And as I tell my husband -- books make good insulation. And winter is coming on fast. 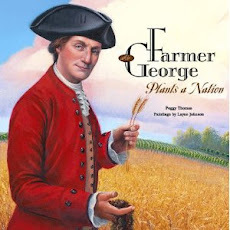 Most people think that exciting nonfiction is a recent invention, but there were authors making compelling reads when I was a kid. Gladys Conklin (1903 – 1983), author of dozens of nonfiction books inspired young naturalists like me for decades. When Gladys started her writing career she was a librarian at the Hayward Public Library in California. Every spring and summer children would come in carrying cocoons and chrysalides and wanted to know what they were, how the insect created them, and what was going to happen next. To answer them, Gladys initiated the Bug Club. She helped children learn about insects by providing them with the tools of an entomologist – jars, cotton balls soaked in alcohol, pins and mounting boards. In her quest to educate her bug collectors, she realized that there was a lack of books that explained basic concepts to children in a clear and direct way -- So she wrote them. Writing natural history did not come out of the blue. When she was about ten years old, Gladys wrote short nature essays for the Washington Farmer magazine. Years later, learning side by side with her Bug Club members she wrote her first book, I Like Caterpillars (1958). Rather than recite boring natural history facts, Gladys wrote from the point of view of a girl (not a boy) who loves all caterpillars, fat ones and skinny ones. Lucky Ladybugs (1968) was structured around the Mother Goose nursery rhyme that every child at that time knew. Like today’s authors of nonfiction, Gladys researched her subjects first hand, first with her Bug Club and later traveling to Europe, Mexico, and Africa. Unlike most authors today, she was lucky enough to work with one dedicated publisher. Gladys thought she might only be able to write 3 or 4 nature titles, but she eventually wrote 25 books for Holiday House. I was not part of her Bug Club, although I would have loved that, but I did learn about insects because her passion shined through. Bugs were not icky. They were interesting. Insects were not something to run screaming from. They were guests to invite into your home for a day, to be observed and appreciated, and then released. 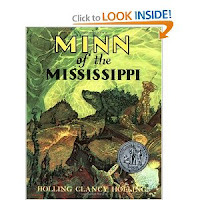 Today, as a nonfiction writer, I am still being inspired by Gladys’s body of work. She followed the advice to “write what you know,” and created a career that lasted well past her retirement as librarian. But what makes her books timeless is her voice. Gladys wrote as if she were talking to her bug club; a casual voice that rings clear and true even for children today.